I must admit I never saw this coming. But then why not? We might as well go the rest of the way in corporatizing our government, er, I meant our elections. ” . . . the House will vote next week on legislation that would end public financing of presidential campaigns and national party conventions. 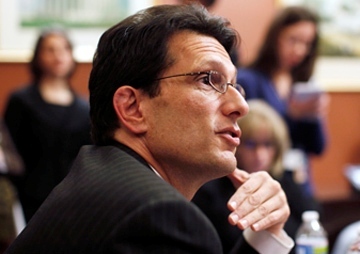 Rep. Eric Cantor is trying to walk back his pledge to protect Israel from US foreign policy. He is failing. A Republican leader of the US House of Represetntatives has just told the head of a Foreign Country not to pay attention to the words or actions of the President of the United States, that the Republican caucus in Congress will protect said Foreign Country from any Official Foreign Policy of the United States of America. I think I got that right. Yeah.